Somewhere Evel Knievel is smiling. More than 40 years after Knievel tried to jump Idaho's Snake River Canyon, someone has finally done it. Hollywood stuntman Eddie Braun climbed into a steam-powered rocket on the canyon's north rim, near the Hanson Bridge and soared hundreds of feet into the air and landed successfully in a farmer's field on the south side. 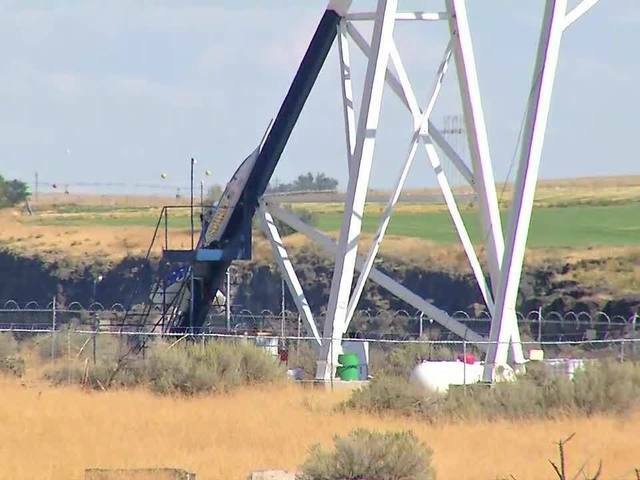 The time of the jump was delayed several times, as organizers tried to avoid huge crowds showing up near the launch site. However, locals got word through social media and showed up from everywhere to watch history. Braun's sole motivation for attempting the jump was because of his childhood hero. Braun said he grew up as a huge Knievel fan. Braun credits Knievel for his decision to beome a professional stuntman. "I don't know if he actually went to the other side of the canyon," Braun told Boise's KIVI-TV this week, "To see what the view is like, I wonder if he ever thought about that." Knievel attempted the jump from a different location, closer to the Perrime Bridge, in 1974. Unlike Friday's launch, Knievel's jump was heavily promoted, and televised to a national audience on ABC's Wide World of Sports. Braun's journey over the canyon started three years ago, when the Idaho State Land Board auctioned off a piece of property for a two-year lease. The original idea was to have the jump take place on the original Knievel launch site and land on the state property of the north side of the rim. Ed Beckley from Texas won the bid, but failed to execute his plan. That's when Braun and engineer Scott Truax planned their own jump on private property, about eight miles to the east.